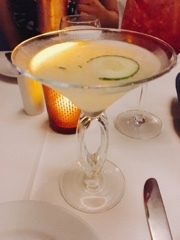 Agua’s menu sounds like the United Nations of the food world: tons of Peruvian specialties, European influences, dishes incorporating Asian ingredients and comforting Italian pastas. 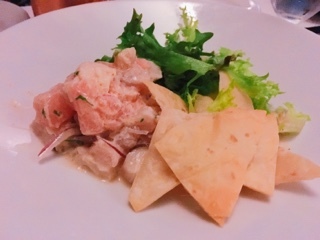 The all-encompassing commonality between the selections is the predominantly seafood-based choices, which isn’t surprising for a restaurant named as ‘water’. Their ceviches (CI$13.50 each) are popular, it seemed every table was graced with one. With five choices, the two we selected were pretty similar: you would think a classic Peruvian (clasico Peruano) and Thai recipe would be different, yet both incorporated the classic lime juice base, red onion and cilantro. The coconut milk added to the Thai version did give that dish an edge, resulting in the ceviche having a lovely creamy finish. Both were good: tender large cubes of fish incorporating enough flavour without being overpowering – you could taste the citrus without a lingering burning sensation. The lackluster wonton chips could use some improvement: not crispy enough to really withstand scooping and much too oily leaving a sheen on your tongue that detracts from enjoying the ceviche’s tastes. 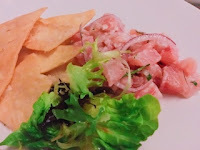 I had my doubts when reading the description of the tuna tartare (CI$14.50) … sweet and sour sauce AND truffle oil? Two very different ingredients that in my mind had nothing to do with tuna. Admittedly, the truffle oil was a tad overpowering, but overall everything worked. The tuna itself was left in large enough pieces to not drown in sauce and the mixture ended up being slightly sweet with a mild chili finish. 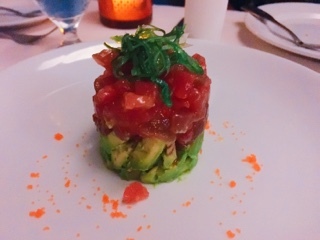 The tower was also pretty, the tartare perched perfectly on a bed of diced creamy avocado. If only there was a taro chip for scooping; with all the flavours something salty and crunchy to tie everything together would have been nice. 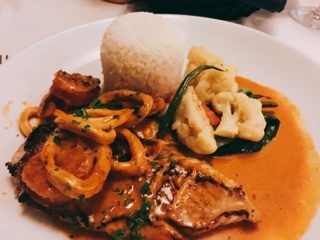 We moved into warmer waters for the mains, my Peruvian mixed grill (CI$28.50) consisting of a perfectly cooked fillet of mild white fish topped with shrimp and calamari rings. Yet it was the buttery aji panca pepper sauce that made the dish: the Peruvian pepper offering a mellow heat, smokiness not unlike chipotle and a slightly sweet finish. If I weren’t feeling full from the rather large appetizers, I would have eaten every drop of the sauce with the steamed rice. 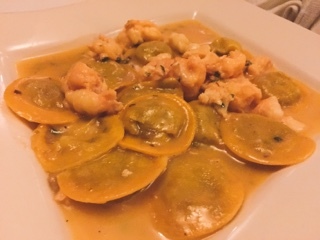 I was glad to see that Agua’s lobster and shiitake ravioli (CI$27.95) was more than a handful of pasta. There were about a dozen, each filled with a mushroom mascarpone and also containing broth so the stuffed pastas had an almost dumpling quality. On top was a healthy portion of cubed lobster finished with a chive butter sauce.